One Touch Optimize is a cell phone tool which can help you to optimize the phone system effectively by ending unnecessary processes and clearing cache data generated in the process to achieve system optimization function. 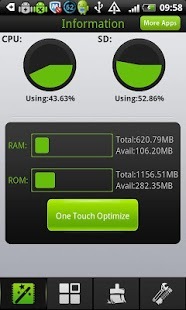 You can quickly optimize the system by Desktop widget, very easy to use! System optimization: Ending unnecessary processes and clearing cache data can effectively improve the speed of cell phone to achieve system optimization results. Process management: Users can customize to stop system processes, touch-hold to protect some processes. Cache clear: Users can choose to clear cache data generated in the process, user-friendly! Regular clear: This app will automatically help you to clear useless cache in the background at the set time. Let your phone always in a high performance. Desktop Widget: By touching the widget on the desktop to quickly start the “One Touch Optimize” feature. At busy times, you won’t have to open any complex apps, just one touch! Optimize your system immediately! Nice one!! Easy to use and complete. I’ve tried others, but this one is fast and simple to understand.